The professor in my class is so good-looking that I cannot help staring at his face, and I therefore fail to concentrate on what he says. What should I do? First of all, please do not stay unfocused with your mouth open (or drooling) for sure. 😉 It would be better to get his attention by writing good papers, asking brilliant questions, or visiting his office to have a nice talk about the class (I stress, about the class). On a romantic front, well, I don’t have much to say. Being a fan is a different issue than having a crush on someone, right? Anyway, no matter if it works out or not, at least the extra effort will get you a fine grade for the class! I have a crush on a good (single) friend, but I’m afraid to let him know lest it ruin our friendship. However, I do know he is looking for a relationship – should I pursue this? How? It is so surprising to know about the large number of SAISers who struggle with crushes and relationship issues. Our school should think of holding events for promoting (encouraging?) relationships, seriously. Anyway, I would like to encourage you to pursue this. I mean, at least you know him well as a friend, which means it is not that you like him only because of his physical appearance or attractive smile. Something meaningful could come of this! I personally wish it works out well for you. I will be cheering you on and you are always welcome to ask me for “individual assistance”. Do you think your crush will be scared if a woman with a pink blazer, huge sunglasses and a scarf wrapping around her head (Jaqueline style) questions him about if he has ever thought about pursuing a serious relationship? First of all, I am really sorry about the situation you face. At least it hasn’t been rainy in DC for a while so I hope you are enjoying the dry-ness of the city. Still, I can give you some suggestions just in case more showers come along (or snow..brrr). Here is a picture for you. 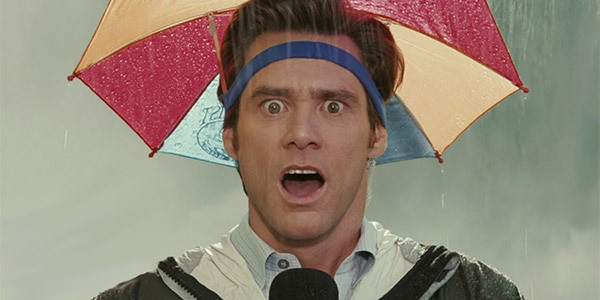 This is Jim Carrey from “Bruce Almighty” and I think you can use his professionalism as a weather broadcaster as a benchmark. Don’t forget that we should stay “professional” at SAIS. If you don’t’ like this nice small fancy umbrella hat or are not able to find one, maybe you can bike fast enough to be able to pass between the raindrops without being hit by them…. or well, have you considered getting a raincoat?